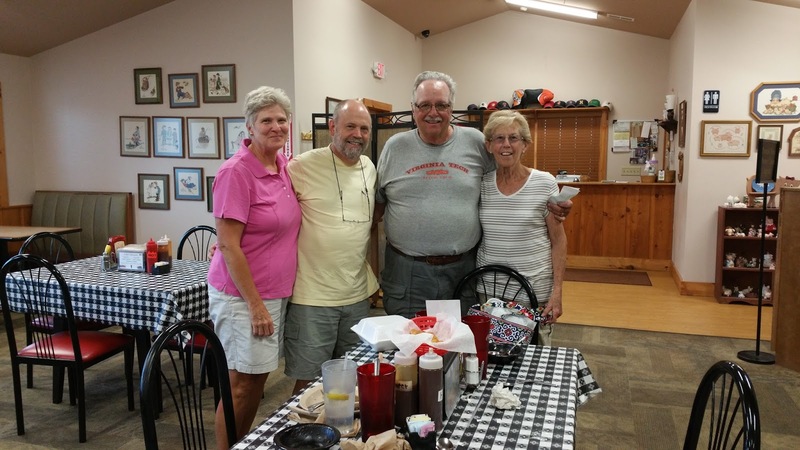 Spring Lake RV Resort, Crossville, Tennessee Got a surprise phone call this week from my dear friend, Marcella. We've been concerned she and Landon might be suffering from a terrible case of cabin fever as they found themselves at home in Ohio last winter after a surgical procedure on Landon's back left him unable to travel to Yuma. 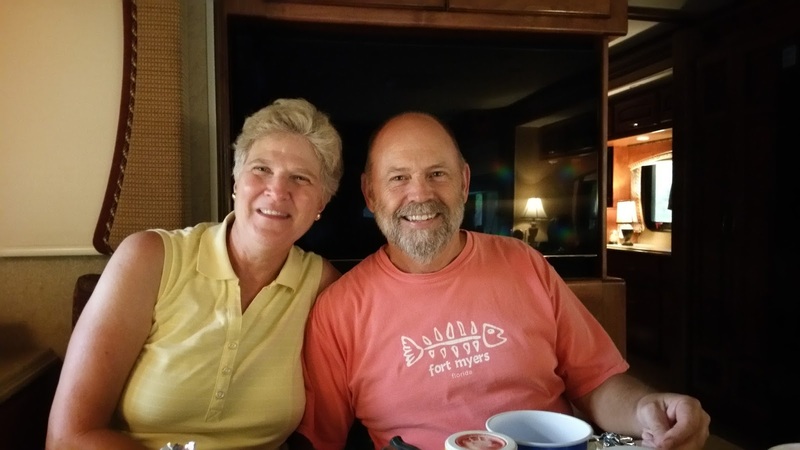 Yuma is where we met them... the first friends we made in this retirement travel journey. I know the winter was terrible for them as they posted pictures of their Phaeton sitting quietly in deep snow far back in the yard of their home in Ohio. Wayne and I spoke of them often and hoped Landon would be recovered sufficiently to travel this year. It's been a long time since we rendevzoused with them in Custer, South Dakota in the fall of 2013. 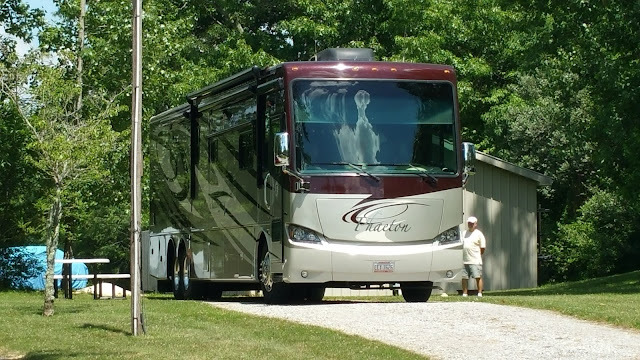 To my great surprise and joy, Marcella said they had been at Tiffin Motorcoach in Red Bay, Alabama and were on the way to Virginia to see family. Wait! We're right on the way! 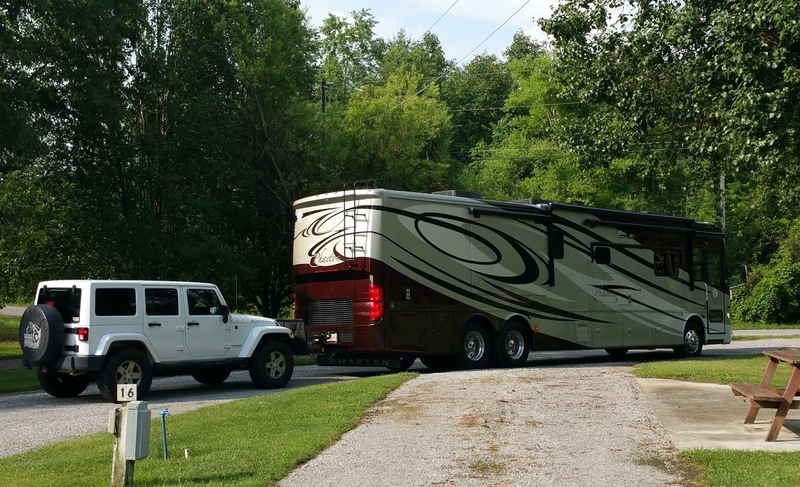 As we spoke, they were leaving Texas T Campground, off I-65 in Cornersville, Tennessee -- just 260 miles from here. We'd see them by dinnertime! 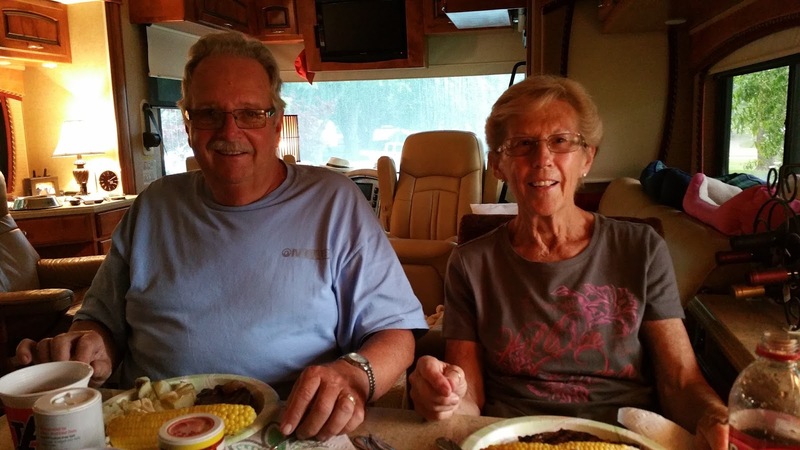 I rushed to the Spring Lake campground office to see if Pat and Leroy had a space for them. Site #12 is available for several nights. The Phaeton is backed into Site #12 at Spring Lake. That's Wayne off to the road side. 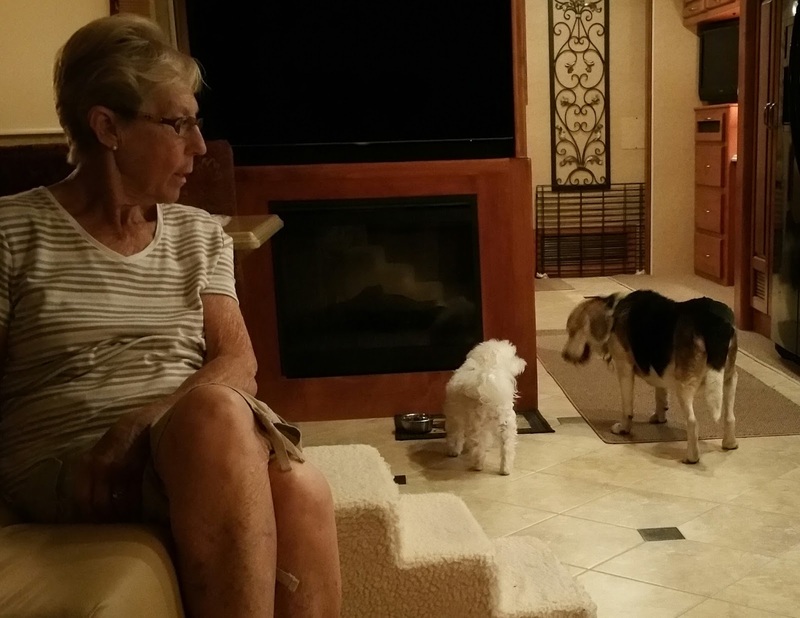 Marcella, Landon and their beagle, BJ the wonder beagle arrived mid-afternoon. As always is the case with good friends, we caught up quickly on all the news of family, health and travel plans. Fortunately, Landon has recovered almost completely. They've been to Tiffin to have a few repairs done to the Phaeton and will return home to Ohio before making an early departure for Yuma this fall. For the reunion dinner, we selected Lefty's Barbecue in Crossville where Landon, Marcella and I ate fried catfish and Wayne, afraid to eat fried food, chose smoked chicken. Dessert celebration was blackberry cobbler -- without ice cream. 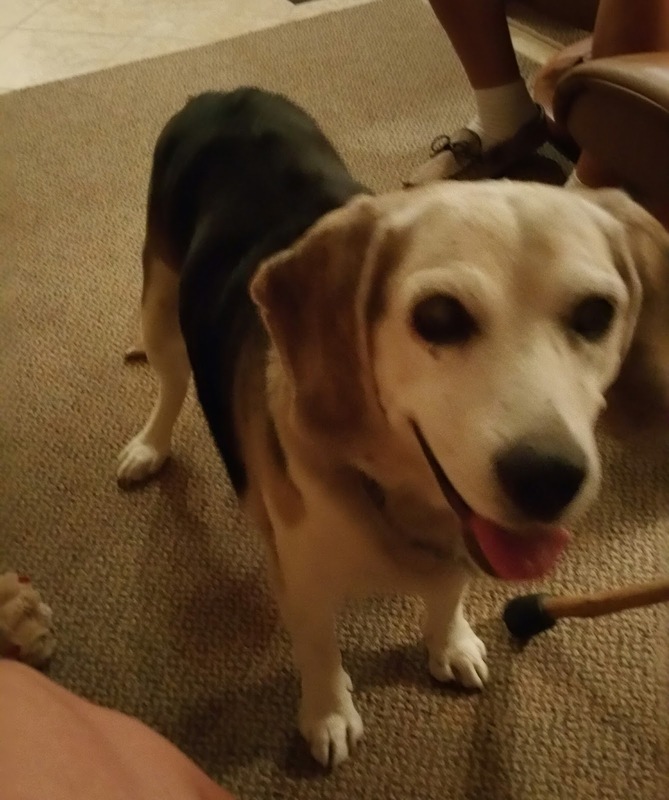 Ozzie re-acquainting with his old pal, BJ the wonder Beagle. More visiting at our place after dinner where Ozzie and Lexie got to renew their acquaintance with BJ, who is moving much more slowly now at age 14 years. With a plan already in place to visit family in Virginia, Landon and Marcella would only get to stay two nights with us at Spring Lake in Crossville, but that gave us one full and one half day to spend together. 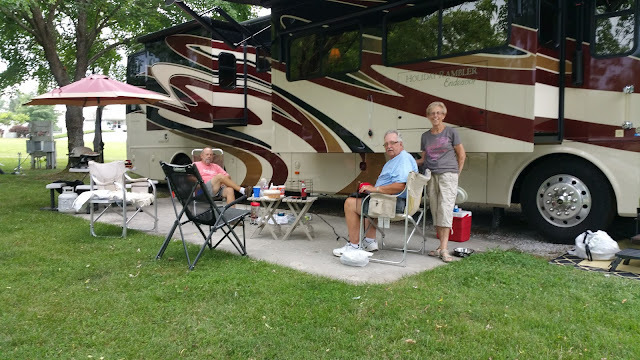 We spent the full day relaxing around the campsite with a plan to cook steaks on the grill for early dinner. ...and all went well with the plan for rib eyes, baked potatoes and fresh corn on the cob until almost time to start the grilling. That's when the clouds rolled in and the rain began. Sprinkles, followed by rain and finally with a touch of thunder and lightening. Marcella and Landon. BJ can't be seen but he's close by. Not easily discouraged, we took our dinner, our dogs and ourselves inside where we ate in a near constant state of laughter. Ozzie was afraid of thunder so he sat in my lap as I ate. 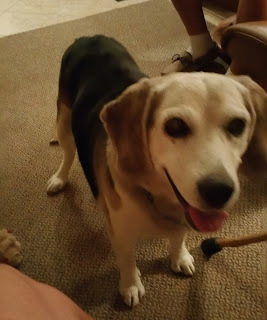 BJ, the wonder beagle, wandered continually around the table, occasionally sticking his big head between our knees, looking up to us as if to ask for a bite of steak. We obliged. Marcella had brought along a "sock it to me" cake which was a first for Wayne and me. It was delicious and I helped myself to two nice sized pieces. The Wayner and me. Ozzie is in my lap. Between rain and thundershowers, Marcella, Landon and BJ retreated to their coach and would leave here by 8:30 next morning in route to their next stop to see family. As we are planning to travel the southwest in the fall, followed by our first trip to Alaska, we expect to see Marcella and Landon next January. Even so, it's not fun to say goodbye to them today.